How Much Do Concrete Footings Cost in 2019? Concrete footings form the base of your foundation. It’s common knowledge that a solid foundation is an essential component of a home’s structural integrity. Concrete footings act as the support mechanism that help to bear the weight of your home. If you think of a bed frame with wooden supports going across, this is a similar image to what you see when footings are placed before a foundation is poured. They act like braces, or the sleepers on a railway track. Without them, your foundation could not support the house efficiently and over time it would crack due to settling. It’s clear that concrete footings are essential, and if you’re planning a new home project, you might be wondering how much they cost to install. 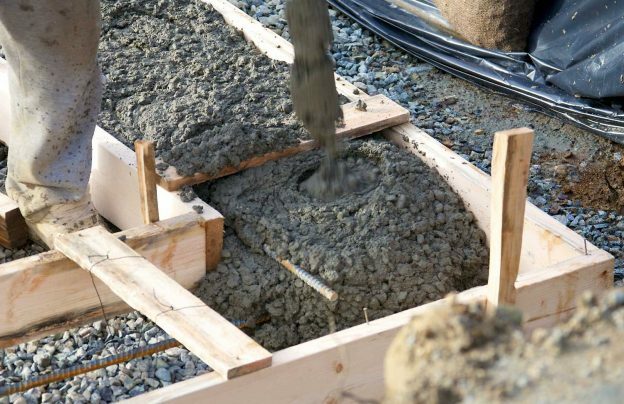 Here are some factors to consider with regards to the cost of concrete footings. Before putting down any footings or starting your house foundation, you should have the soil tested to ensure you are using the right strength and amount of materials. Different types of soils have different capabilities when it comes to how much weight they can hold before sinking. Soft soils like sand are less efficient than more sturdy soils. The most resilient type of soil is crystalline bedrock, which can withstand 12,000 pounds per square inch (psi), while the least resilient is clay which can only withstand 2,000 psi. Doing a soil test before beginning work will help you figure out how to compensate for any weaknesses in the soil’s weight-bearing capacity. A weaker soil needs wider footings, which means more expensive footings. The type of house or property you’re building will impact the type, width, and amount of footings used. A two or three story home will exert much more pressure on the soil trying to withstand the weight than a single-story home, for example. The layout of the home will also determine the number and size of footings required. Hiring a skilled team with experience in planning and pouring footings is essential to a successful project. A misplaced footing will make your foundation shift and potentially crack. A cracked foundation is a serious problem! Hiring experienced professionals who specialize in footings and foundation work will reduce the chances of foundation issues later. Building codes are different all over the country and are stricter in some areas than in others. In some areas, the code requires more substantial footings than in others, which will determine how much they cost. The very climate you live in determines the difficulty and expense of the concrete footing project as concrete deteriorates more quickly in hotter climates. Thus, if you live in a state that reaches high temperatures, you may find that the concrete you purchase will be more expensive due to the necessity of preservatives or treatments included in the material. In colder climates, footings may need to be deeper to get below the frost-line to prevent upheaval and shifting due to freeze-thaw cycles. Footings cost on average between $1 and $2 per square foot of the home. This sounds inexpensive, but it all adds up, particularly for larger homes. The size and linear foot dictate the price of concrete footings. When you want to know precisely how many concrete footings you need, or how much they will cost without reference to the size of the property, the answer is often provided in linear feet. Linear feet is another way of expressing a length in feet, learn more about that in our guide to calculating linear footage. So, How Much Do They Actually Cost? Once you know the type and weight-bearing capacity of the soil you intend to build on, consult with your contractor to find the width and depth of concrete footing you need to meet building code requirements in your area. Concrete is sold by the cubic yard and general costs approximately $115 per cubic yard for a 2,000 psi rated mix. Use a concrete calculator to find out exactly how much concrete you need for your project as long as you know the dimensions of the area you need to pour. Get several free estimates from concrete professionals in your area to find out how much your project will cost.